Crabapple trees are a common host to an easily identifiable insect pest--the bagworm. Though these pests choose many deciduous tree hosts, the crabapple often suffers severe infestation. Familiarize yourself with the feature and habits of this insect as well as effective control methods for healthy, vigorous growth of home garden crabapple trees. To avoid the need for insecticide use or for more successful effects, keep your tree vigorous through proper care. Healthy trees are generally more apt for resistance and retaliation against insect infestations than weakened or stressed trees. Grow crabapple trees in locations that provide full sunlight. Crabapples prefer moist, well-drained soil with an acid pH of 5.0 to 6.5, according to the Clemson University Extension. After bagworm caterpillars mate, the adult male dies and the female lays eggs within a self-formed bag where she then dies. The eggs overwinter until June and larvae hatch and emerge. Larvae are light brown to brown in color and measure approximately 1/8 inch in length. Once they find a host plant, bagworms spin a silk bag around themselves, leaving their heads exposed for feeding until the end of August. When feeding is over, they adhere themselves to a branch and proximate foliage. Since the larvae are tiny and lightweight, they are often taken by the wind and begin infestations on new host plants after hatching. During feeding, bagworms chew on leaves, causing browning of foliage and defoliation in severe cases. 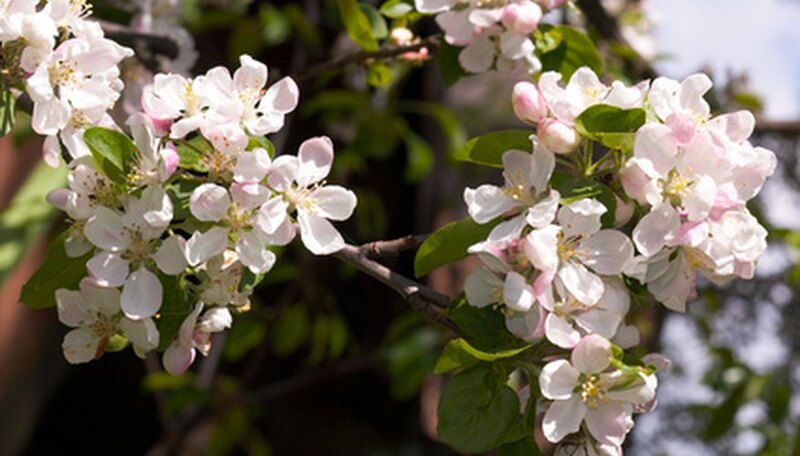 Since crabapples are deciduous and produce new growth, infestations are usually mild, but younger trees may experience growth problems like diminished growth rate. To prevent the stunted establishment of young trees, insecticides offer assistance. Providing your tree with as much natural control as possible makes insecticide use more efficient, as part of the problem is already taken care of. Before chemical application, particularly on smaller crabapple trees, locate hanging bagworm bags during the winter and beginning of spring. Remove the bags by hand and, as the University of Nebraska Lincoln NebGuide suggests, kill the larvae by submerging the bags in a water and soap solution or smash the bags. Since the tiny larvae may still be present on the tree or on the ground, following this method with an insecticide ensures thorough control. For the best chemical control, apply an insecticide from May to June as bagworms are creating their bags that do not yet reach a length of 1/2 inch. After this point in development, insecticides lose their effectiveness for bagworms on crabapple trees. Neem oil is an option that is gentler on trees than the more powerful and recommended chemical insecticides including an active ingredient of acephate, permethrin, bifenthrin or other chemicals formulated for crabapple trees. Though both options are effective, neem oil requires repeat applications. For your safest application, particularly on younger trees, contact a licensed professional or your local county extension agent for assistance.